Kamil Crater. Image credit: Luigi Folco. 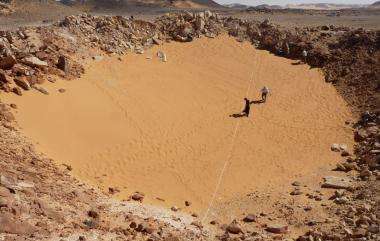 (PhysOrg.com) -- A pristine meteorite impact crater has been found in a remote area of the Sahara desert in southwest Egypt. The crater was originally noticed on Google Earth images, and is believed to be only a few thousand years old. The 45-meter-wide and 16-meter-deep crater, called Kamil, was probably formed by the impact of an iron meteorite, and was first noticed on Google Earth images in 2008 by Vincenzo de Michele, former curator of the Civico Museo di Storia Naturale, in Milan, Italy. 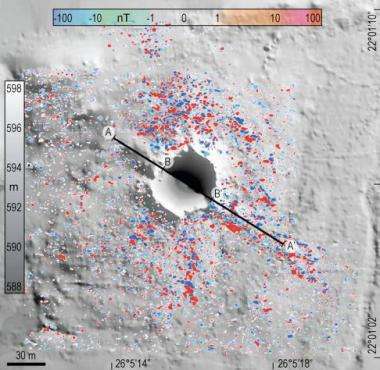 Now researchers led by Luigi Folco, meteorite curator at the Museo Nazionale dell'Antartide attached to the University of Siena, have also reported finding the crater in satellite images taken in 1972, and have visited the site. The report is online in the latest edition of the Science journal. The rim of the crater is three meters high and is surrounded by spokes or rays of light-colored material blasted out of the crater by the impact. Folco said “rayed craters” are extremely rare on Earth but common on Mars or the moon, where the sparse atmosphere provides fewer environmental processes to erode them. On Earth such rays or spokes are usually eroded or covered quickly. The scientists traveled to the site last year to confirm the discovery, and returned in February this year. During their expeditions they have located over 5,000 pieces of iron meteorite, weighing 1.7 tonnes in total, and they estimate the original meteorite was around 1.3 meters wide, weighed 5-10 tonnes, and hit the Earth at about 3.5 kilometers per second, causing most of its material to vaporize. Digital elevation model of the Kamil Crater with superimposed magnetic anomaly map detected after systematic searches and collection of meteorites >10 g. Image credit: Luigi Folco, Science Express, doi:10.1126/science.1190990. Folco said the crater is so well-preserved it will provide a lot of information on small-scale meteorite impacts. There are only 176 confirmed impact craters on the Earth’s surface, but most wear away quickly, and only 15 of them are smaller than 300 meters in diameter. The new crater will help scientists to assess the hazards posed by small meteorites. Such impacts occur about once every 10-100 years, and most small meteorites burn up as they enter the atmosphere and do not reach the ground. The team also analyzed samples of soil and glass formed by fusion of sand at the site. They hope these analyses will help them pinpoint the age of the crater, and preliminary results suggest the meteorite probably hit no earlier than 5,000 years ago, which is recent on the geological time scale. The coordinates of Kamil Crater are 22º 01' 06" N 26º 05' 15" E.
What about this location in Chile??? That surely looks the same to me. Well spotted.